Let’s just jump right into this one: as I’ve grown older, I find that getting food on my fingers grosses me out. 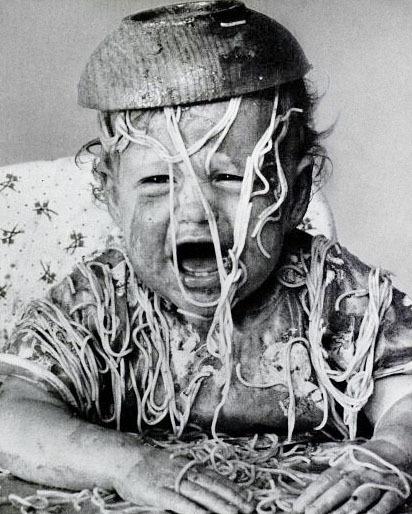 This classic photo has been around for decades. It’s hard to find words to describe how effing gross this is to me. Poor kid! I don’t like having dirty hands in general but I’m pretty sure that’s a universal truth … not anything out of the ordinary. Specifically, I don’t like getting greasy or sticky food on my fingers. I can grind my palm on the ground or dip it in motor oil and outside of not liking my hands being dirty, I’m okay with it. But holding a slice of greasy pizza or having ice cream melt down my palm is unacceptable. One would think that a dirty hand is a dirty hand, right? I’m not quite sure why greasy or sticky food is big problem for me. Even watching someone get messy fingers gets me squeamish. For the sake of full disclosure, this phobia is not all-consuming. I’m not seeing a shrink or wearing surgical gloves to Famous Dave’s. It’s a mild weirdness but it does cause me to have certain rules while eating things with my hands that most people wouldn’t think twice about. The most frequent questions are: How do you eat ribs? Does it keep you from eating chicken wings? What about pizza or hamburgers? Have you consulted a specialist? Stuff like that. The answer is no. The phobia doesn’t keep me from eating all the things I love to eat. My belt is evidence of that. The poor thing is like a high-tension cable on a suspension bridge. My love for food trumps this stupid “dirty hands” issue every time, however, depending on what utensils or cleaning facilities are available at the time, it does alter how I eat it. Oftentimes pizza, hamburgers, rickety sandwiches, burritos, and wraps are eaten with a fork and knife. For those reasons, I had inadvertently developed a rule for eating which my friends have dubbed: The First Knuckle Rule. The First Knuckle Rule states that while eating something greasy, sticky or with a sauce, such as BBQ ribs, chicken wings, etc., I can hold the food with the forefinger and thumb of each hand, but the sauce cannot travel down my fingers below the first knuckle. Only the forefinger and thumb are allowed to become soiled. No other fingers may participate. There is only one exception to this rule: popcorn. When eating popcorn, I allow the middle finger to be involved and allow touching the food past the first knuckle but only up to the second knuckle. These allowances are predicated on the trust that popcorn is primarily dry. In addition, I always get the huge tub and plenty of napkins while at a theater. The wide open mouth of the tub ensures that while reaching in to get popcorn, no other part of my hand will accidently touch the sides. I mean, there could be some BFO (butter flavored oil) on the sides. Ick. I’ve been into SPAM my whole life. I remember eating SPAM and rice since I was a kid. Love it! Now, as an adult, I always have at least two cans of SPAM in the cupboard. And what self-respecting Asian wouldn’t have rice in the house, am I right? 2012 marks SPAM’s 75th birthday so might as well give it some blog time. SPAM Musubi – Yeah I know, it’s basically still just fried SPAM and rice but it comes with noori AND you can add furikake and teriyaki! Fried SPAM slices and rice used to be my favorite way to eat SPAM. When my sister got back from completing her graduate studies at the University of Hawaii, she turned me on to SPAM musubi. WTF?! 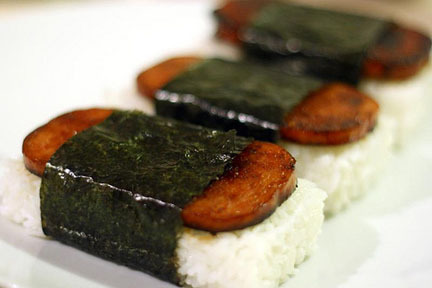 How could I have not known about SPAM musubi for so long? It’s heartbreaking! In musubi form is now my favorite way to eat it and there are many delicious variations on the SPAM musubi recipe. Yum! I don’t know if this is a universal truth, but it seems to be accurate in my circles: caucasian folk don’t seem to have a fondness for SPAM. I’m not even sure if their dislike is from trying and not liking it, or if they think the idea of processed meat delivered in rectangular cuboid form is unsavory. Give it to me in any shape … I’m frying it up and eating it with rice! • In 1936, Hormel Foods came up with a precooked meat product simply called Hormel Spiced Ham. They held a contest to name the new product and in 1937 SPAM was introduced to the world. The contest winner was awarded $100. • The typical SPAM can contains 12 ounces of SPAM. The SPAM loaf is 3.75″ wide x 3″ tall x 2″ deep. • From 1941 to 1945, 100 million pounds of SPAM was shipped to Allied troops during WWII. • In 2001, the SPAM Museum opened to the public at 1101 N. Main St., Austin, MN. Happy birthday SPAM! I love ya! Well, here it is. I post this timidly … this will be my first attempt to get back into artwork. Why am I so nervous about this? Like I’d said in my previous post, it’s been 17 years. No artwork at all. Sad, really. I’ll be working on a 30″ x 22″ sheet of white watercolor paper. I tried to get one with a little tooth. As this is my first attempt in many years, I stuck to a more affordable paper. In retrospect I feel I should’ve purchased a buff or blue hued paper, or possibly stretched this paper and then laid down a watercolor wash but I’m foregoing that this time around. I really, really just need to get color on paper! Getting started is the hardest part for a lazy person like me. This will be a pastel chalk drawing. Working in pastel chalk has always been relatively easy for me. Mixing dry colors visually is magnitudes easier than mixing paint on a palette or canvas. That will come later if I’m fortunate enough to bolster my confidence with a few successful, or at least “promising,” images under my belt. This image came to me while I was eating sushi. That I was eating sushi really has nothing to do with the image. I only mention it because you might notice that the sketch was made on the back of a order menu from Sumo Sushi house here in southeast Las Vegas. If you’re ever there, say hello to Jay. He’s the owner, a excellent chef and an all-round great guy. If you buy him enough sake, you’ll get dinner AND a show! It was the unfortunate circumstance of a friend that he was going through a divorce. He and his wife had four children. As I sat by myself eating sushi, I wondered how emotionally taxing it must be to have to go through something like this. I wondered if I could say something visually about it. And although this image was influenced specifically by my friend’s divorce, it could also be about loss. The image portrays oranges and orange slices sitting on a plate. The plate sits on a table and to the left is a beverage cup ring. I’ve tried to use symbolism to convey the message of separation and loss. In this case “loss” doesn’t mean a death, but that something important is no longer always available. I wanted to convey a form of emptiness or transformation. I placed four slices next to the oranges and arranged them to specifically cross the edge of the plate on which they sit. These four slices, one for each child, show that the children are able to cross over the division between the parents. It’s also a separation between the present and the past. This separation is visually shown by the hard edge of the plate. Only the slices cross. The oranges, representing a parent, do not. The cup’s ring represents the other parent and the old life. I decided to use a beverage ring to represent something that was there and is now absent. We can also assume that a vessel that was once full is now empty. 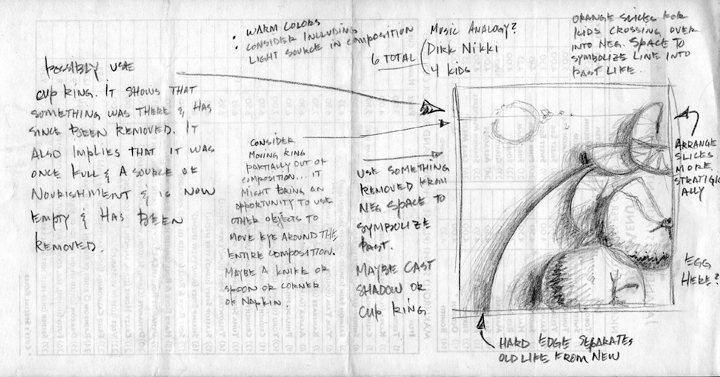 Now that you know a little background and have seen the original quick sketch, I’ll post photos showing its development with accompanying notes about color issues, composition, etc. My fingers are crossed. I haven’t made any attempt at creating artwork in approximately 17 years. As a child I was a rather talented pencil sketcher. Mostly I’d try to recreate my favorite cartoons in the Sunday comic strips. When I was in 4th or 5th grade I created a “timeline” as a history project. Along important dates on the timeline, I drew important figures, objects or places. I was then held after class and accused by my teacher of not doing the project on my own and asked who I employed to do it for me. I remember it being scary and uncomfortable but I told her the truth … that was my work. But mostly I remember asking myself why she wouldn’t believe that I had done the assignment all by myself. By the end, although reluctant, she decided to believe me and her last statements to me were, “These are good drawings, you’re very talented.” Not much consolation to a young boy who felt scolded for doing good work. In high school I never sketched or painted a thing. Not one thing. In college I was taking business classes … and hating every minute of it. Boring. It wasn’t until I was in these mind-numbing courses that I began to doodle in the margins of my notebooks, and of course, getting mediocre to poor grades. Friends sitting next to me in class would say, “Why don’t you try taking some art classes?” I’d waited a whole semester before finally taking their advice and switching to the Bachelor of Fine Arts program. I started getting A’s again. During and after college I’d become a graphic designer. No formal training … I just seemed to have a knack for it. I got my first break when a friend’s father, who owned a small advertising firm and had seen my sketch work, hired me as an apprentice in the graphic design shop. There I met some wonderful and interesting (read quirky) designers who were willing to teach me all that they knew about advertising design. Within a year into my apprenticeship, I was asked to submit designs for a restaurant branding assignment for which the firm was pitching. Although my designs we clunky and novice, they did show signs of potential, and within a few years I was involved in all the company’s design projects. I loved working there. Now at age 47, I’m still a graphic designer and still liking the field, however, I find I’m unfulfilled as a fine artist. Although graphic design is a very creative field, it’s still work-for-hire and therefore one still must work within customer requirements and limitations. At this age, I feel my design work is losing steam, especially up against the wonderful, new, young talent that crops up every year. But I don’t want today’s post to be about my tired design skills. This entry is about my attempt to reinvent myself as a fine artist, even though it’s merely as hobbyist. I don’t know where the effort will lead and I don’t really care … as long as it fulfills that visual voice I held quiet for such a long time. In the very near future I’ll be posting my preliminary sketches with notes and thoughts about the how’s and why’s of the images I plan on creating. Seventeen years is a long time … I hope my artistic chops are ready for the challenge.